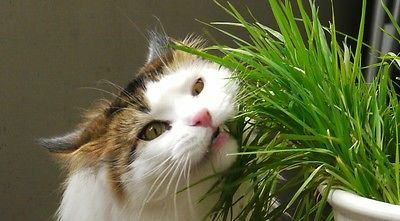 Growing your Pet Grass Have you ever noticed your pet eating grass or nibbling on plants and wondered why? The answer may be as simple as your pet satisfying a natural craving for grass. Although some pets are more interested in nibbling on grass than others, if yours is one that does, you should be careful about allowing your pet to go outside to munch away. Lawns and other outside plants are often treated with chemicals such as pesticides, fertilizers, or insecticides that are poisonous to animals. If your pet isn't able to satisfy its craving for grass outside, it may turn to nibbling on your houseplants. Unfortunately, not only might this be undesirable, but it may be deadly. Certain houseplants can be very dangerous or deadly to your pet regardless of whether they have been chemically treated. A simple and safe solution to satisfy your pet's craving for grass is growing pet grass. Growing pet grass is easy! It grows quickly and is very easy to tend. Growing your own supply of greens will insure that your pet eats only healthy organic grass.